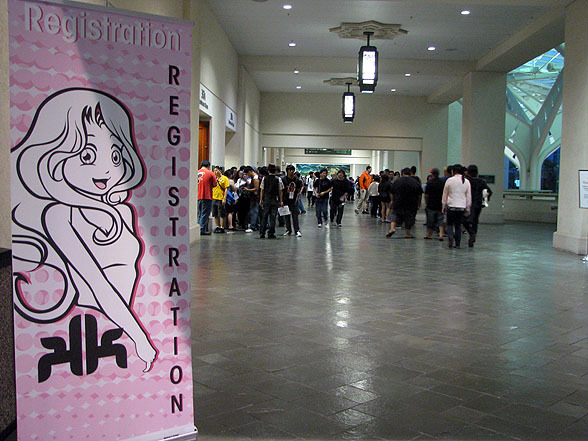 [Kawaii Kon 2013] Day 0: With a twist! Day 0 of Kawaii Kon is when you really start to feel the electricity, the energy, of another year’s convention having finally arrived. It may be logistical stuff — badge pick-ups, vendors and artists moving into the Dealers Room and Artist Alley, final technical kinks being worked out in the other rooms — but all of it means that tomorrow morning, those of us who are into the whole anime and manga scene are going to party like it’s X/1999 (well, without the whole death and destruction and end-of-the-world apocalypse stuff). It’s also the first chance you get to see this year’s designs for the convention program and badges. You can see a picture of what I got to the right. 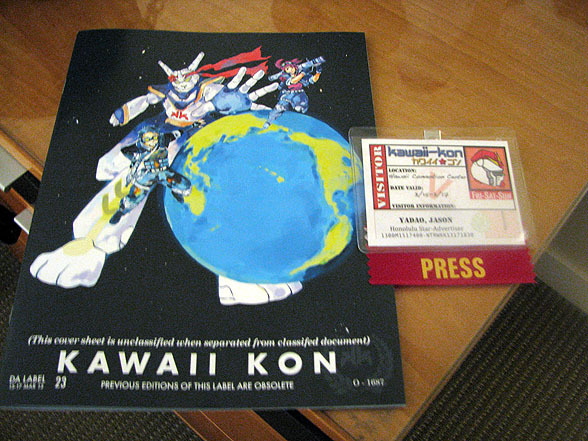 The program’s certainly the largest I’ve seen over Kawaii Kon’s history, an 8.5-inch-by-11-inch book, with lots of colorful pages contained within. (There’s also 100 percent more giant bunny robot content on the cover than I’ve ever seen before.) This year’s badge also has a anti-counterfeiting hologram, another first. Of course, to get all of that, you had to wait in line first. 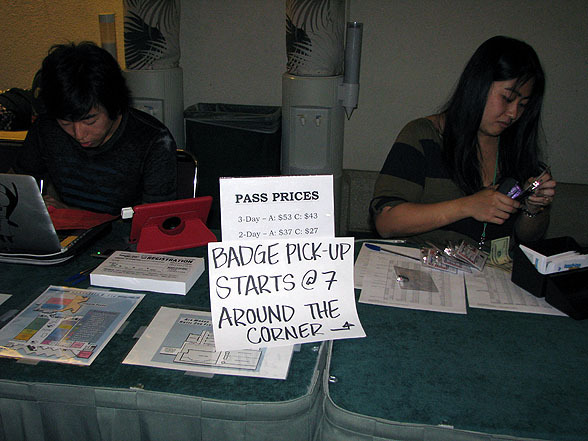 And so, here was the registration scene 15 minutes before the scheduled start time of 7 p.m.
… that is, of course, if you were expecting preregistration to be in this area, where it’s always been since 2007, with the line of booths at the front and the line extending back around the corner and toward Kalakaua Avenue. But hey, guess what, curveball! This year, for the first time, general registration was located in a room — the room where some of you may recall the video game room was located in previous years. There’s also a spiffy new, very pink banner. Also new to this year: names were divided up into individual letter stations. It seemed to make things go faster. And yet there were still familiar touches here and there. 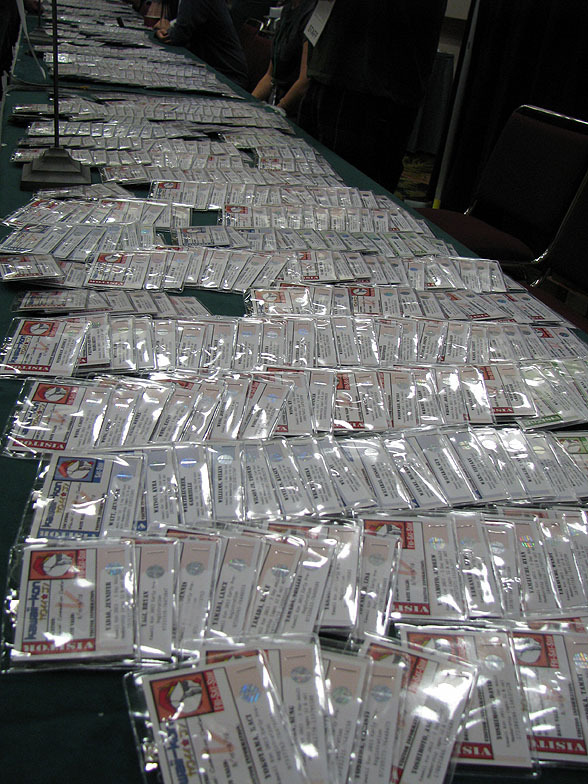 The fact that there are a lot of badges to process, for starters. Which, of course, meant that the lines for general attendees — one for people with last names beginning from A through I, the other for people with last names from J through Z — was still long. … no, no, long-enough-to-not-be-able-to-see-that-pink-banner-up-front long. 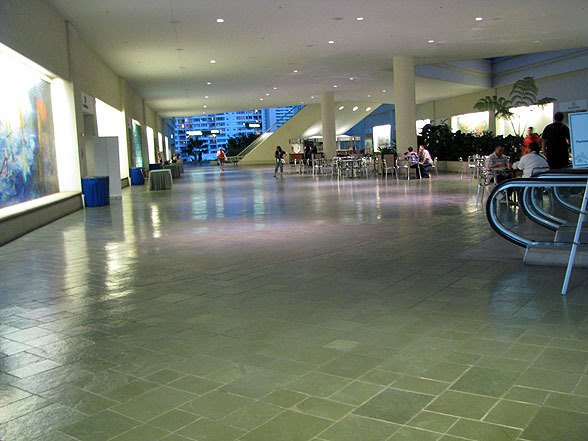 … no, no, that J-Z line went around the corner and into … hey, did you guys know there’s a children’s courtyard at the convention center? 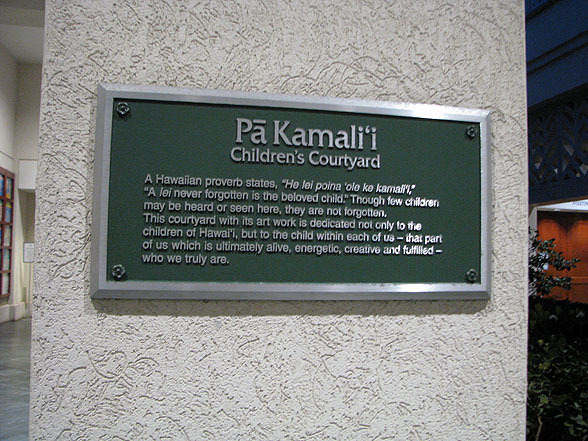 Six years of attending Kawaii Kon, and I’ve never had a chance to actually see this courtyard until now. 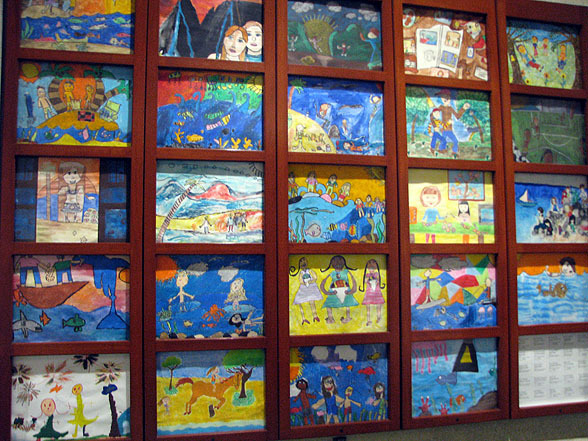 The artwork tiles are cute! Check it out if you have an opportunity to take a breather this weekend. But I digress. 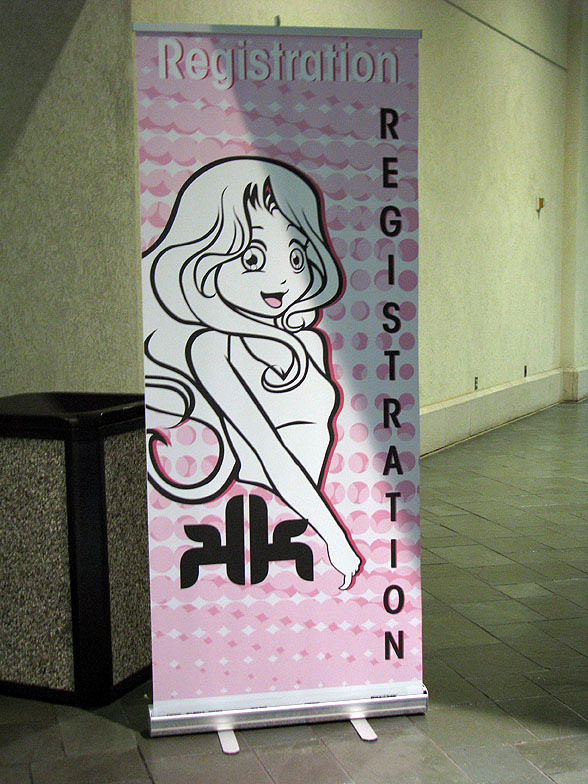 My destination was the professional registration table, which, aside from being outside of the general registration room, also had a handy sign pointing out where general attendees could go. The staffers, of course, were hard at work. It was also nice to meet one of my few dozen readers for the first time tonight — Bridget, I believe, was her name? And sitting near her there was also … oh, gosh, I forget his name, John? Jeff? Something with a J? I do remember that he had a coworker named Scott who joined him as I was leaving, and that he was playing Fire Emblem: Awakening on one of those lovely royal blue limited-edition Fire Emblem: Awakening Nintendo 3DSes. If any of you whom I met would like to clarify anything in comments, please do! My mind has admittedly been a bit frayed all week. Coming tomorrow: Convention time! Come on and grab your friends! We’ll go to very distant lands (for our meals, because man, Blazing Steaks, Subway and 7-Eleven get crazy crowded busy during the weekend)! Of course, I’m not sure if Jake the Dog and Finn the Human will show up — the preceding few sentences having been a riff on the Adventure Time theme, for those of you not familiar with the show — but who knows, that show is pretty popular, so cosplayers dressing up at those characters may be a virtual lock. Or the “Let Us Tell You About Homestuck” panel could just end up breaking out and taking over the entire convention. Either way, something’s bound to happen, right? You KK preview was only 1/3 of a page on TGIF. 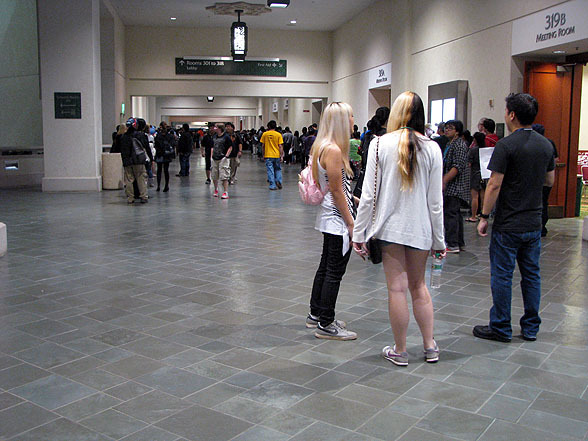 You’d think a convention with over 6,000 attendees would get space. And 30 inches of a profile about Hachi Maru Hachi, PLUS a 12-inch sidebar about other things going on at the convention, in Thursday’s paper ISN’T your definition of “space”? Honestly, I don’t know what I can do to please you anymore. I’m actually quite offended.